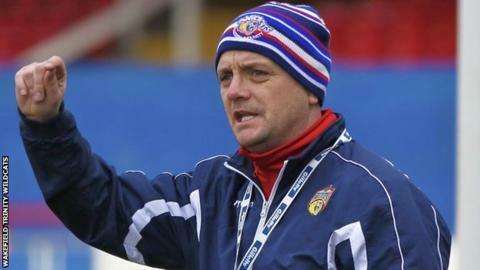 Wakefield Trinity Wildcats coach Richard Agar accepts his side face a "huge task" in their play-off eliminator against Leeds Rhinos. The Wildcats won their last seven regular season games to set up a trip to fifth-placed Leeds on Saturday. Agar told BBC Radio Leeds: "There's no better side at getting to Grand Finals than Leeds Rhinos. "It's going to be a huge task for us and we can't underestimate our achievement in reaching the play-offs." But Agar said: "Now we're there we want to throw everything at them and hopefully produce a great game." Bradford's defeat against Catalan Dragons meant Wakefield had already secured their place in the top eight before beating Salford on Saturday. The former Hull FC coach praised the influence of half-back Tim Smith on the team's run of victories. Smith, 27, joined the Wildcats from NRL side Cronulla Sharks last November and agreed a one-year contract extension in July. "I think he's the form half-back in the competition and he's the best passer in the game, in my opinion," Agar said. "He's been brilliant for us this year and he's really thrived in the role we've given him and really repaid us."